Your body language plays a big role in how you appear to others. Every guy is different when it comes to what attracts him and how he sees the world. For example, some guys are sporty and want a companion with similar tastes, while other guys may be more inclined to hang around the house. No matter what type of guy you're interested in, psychologists and other experts note that there are specific ways that a girl like you can increase your odds of attracting him. If you think physical attractiveness and beauty are all about genetics and good cheekbones, you're not exactly correct. In his column "Being Beautiful or Handsome Is Easier Than You Think!" for "Psychology Today," Jeremy Nicholson, a social and personality psychologist, notes that the things in girls that guys often find most attractive fall into the category of "self care." That category includes aspects of your appearance and health that are actually in your full control and don't depend on your parents' genetics. Examples include wearing clothing that fits properly, putting on makeup, styling your hair and maintaining general health by eating well and going to the gym. One reason guys may find this attractive is that self care signals positive things about how you value yourself and how much effort you put into life. When picking out your wardrobe for school or work, choose something that's red. In the 2010 study "Red and Romantic Behavior in Men Viewing Women" published in the "European Journal of Social Psychology," researchers found that red triggers certain parts of a guy's brain to make him think you're more attractive. If you want to catch a guy's attention, try variations of red -- they all work, not just bright red -- like rose, wine or burgundy. Take it one step further by meeting a guy in a red environment if possible; simply putting yourself against a red object or against a red wall can make you more attractive to him. Flirting and getting a guy to like you isn't just about the words you use. It's also about the words you don't use; namely, your body language. When you first meet a guy you're interested in, use small gestures and lean backward -- this makes you seem less intimidating. As the night goes on and you get to know the guy, change your body language to appear more engaging. Try leaning forward slightly and use bigger, more sweeping gestures as you talk. This is what psychologists call persuasive body language, and it can boost your attraction levels on a date. Finally, remember to smile at all times. No matter who you're talking to, a smile makes you appear friendlier and more attractive to everyone. If you run into your crush when you're out with friends, every cell in your body may be screaming at you to pursue him. But don't try too hard, as appearing too happy to see him or too desperate can actually turn him off and make him less interested in you. A common example of trying too hard is if you always are the one texting or calling him. Make him work a little for your attention. It can actually make him more interested in you. 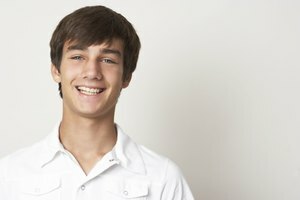 Psychology Today: Being Beautiful or Handsome is Easier Than You Think! Duvauchelle, Joshua. "Tips for Girls on How to Attract Guys." Synonym, https://classroom.synonym.com/tips-girls-attract-guys-15488.html. Accessed 23 April 2019.